It all started on Sunday. Tristan's everyday runny nose from allergies went into overdrive. He was coughing every other minute. I had a feeling the night may not go well. As the evening came, he began to whine with every cough. 'Not again', I thought. He was just getting over being sick a couple of weeks ago. Sunday night was worse. Since Scott is off Mondays, he took over watching Tristan. From about midnight on, Tristan was up every fifteen minutes, coughing, crying, and whining. I took over at about four in the morning - Scott really needed some sleep. I got a two hour stretch out of him before he woke up - again, coughing, crying, and whining. He was so exhausted and miserable. I just wish I could take that for him. In fact, I've been under the weather, too. At one point, Tristan just looked at me with tears in his eyes. With desperation in his voice, he uttered, "Mommy, help." I just wanted to break down. I couldn't do anything besides hold him and rock him. We took him to see his doctor. He said he has a nasty cold, but he heard possible wheezing. So, we did a nebulizer treatment. After the treatment, his doctor noted an improvement. 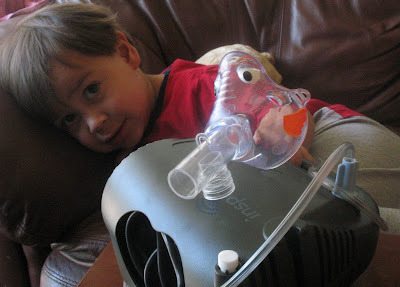 He sent us home with a prescription and our very own nebulizer pump, complete with a fish face mask. Fortunately, Tristan has actually taken well tot he treatment. We've allowed him to hold onto the mask and hold it up to his face. He likes switching out between the mask and the boring mouthpiece it came with. And when it is finished, with some protestation, he turns it off himself. Now that I think of it, he actually has no issues taking medications - allergy meds, tylenol, and now this. Should I be worried? He may look sad, but he was actually playing around. He kept asking "Turn on?" Showing what a big boy he is by holding the mask to his face. Well, he's on this for the next week. Hopefully, he'll be better soon.